‘Global Ireland’ is an ambitious government programme to double Ireland’s impact in the world by 2025. The programme was launched by the Taoiseach, Tánaiste, and Ministers of Enterprise, and Culture in June 2018. ‘Global Ireland’ sets Ireland’s global footprint into three broad areas, how we trade, the bilateral and multilateral partnerships we build, and our wider contribution to the world. The ‘Global Schools’ programme is a means of engaging second-level students across the country in the three central elements of ‘Global Ireland’. 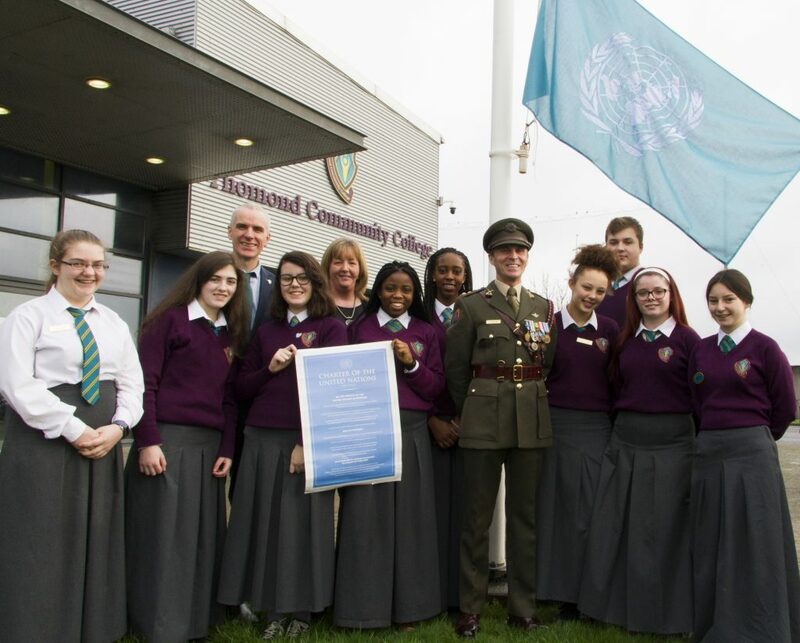 On January 10th Thomond Community College was the 1st school in Limerick and one of only 20 schools nationally to host a Global Schools Delegation. Captain Brian Lynch of the Defence Forces and Mr Donal Cronin from the Department of Foreign Affairs & Trade spoke of Ireland’s role in the wider world. Students heard about the work of Irish Embassies abroad, Irish bilateral & Ireland’s peacekeeping history. After an excellent Q&A session, a copy of the UN Charter was presented to the school. It was accepted on behalf of the school community by Principal Norma O’Brien, Cllr Kieran O’Hanlon, Chairperson of the Board of Management, Ms Christine Moloney, vice-chairperson of the Parents’ Association and Aisha Garba & Aimee Williams senior and junior chairs of the Student Council. Captain Lynch then raised the UN flag at the school.